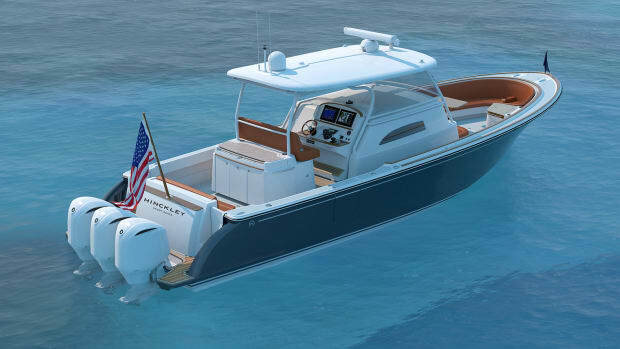 At first glance, the renderings for the new Hinckley Picnic Boat 40 look, in many ways, conventional. 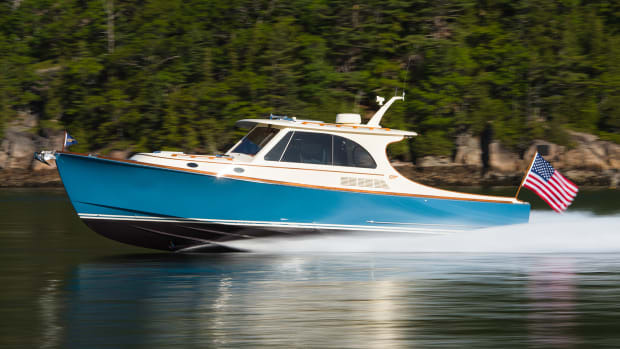 From the flag blue hull to the sweeping teak sheer line and open salon, you’d be forgiven if you think you’ve seen this boat before. 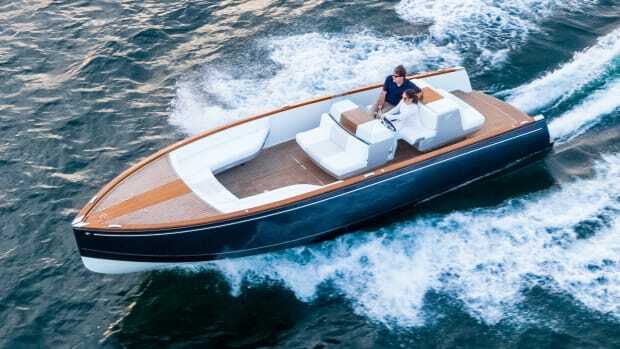 However, this new 40 has multiple tricks up her sleeve; the one that caught my eye first was an innovative—not a term I throw around loosely—hull-side door that actually slides away into the gunwale and a cockpit step that lowers into the hull (if you’re having a hard time visualizing this head over to pmymag.com/Hinckley) with the goal of not impeding on valuable entertaining space while contributing to the boat’s clean lines. I’m going to go on record here and say that if this disappearing door works as well in person as it does in Hinckley’s video, then this is going to be something we see other builders incorporate. 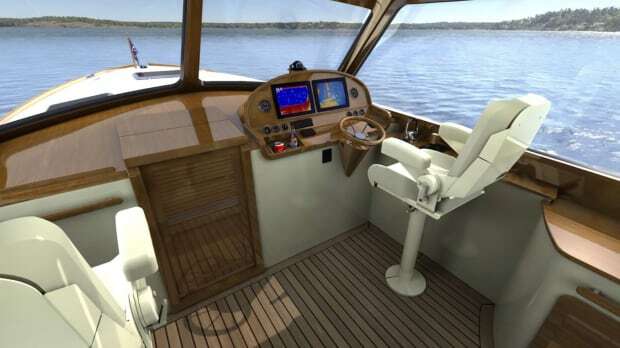 Another significant element of the 40 that you don’t immediately see is the technology incorporated into the hull. 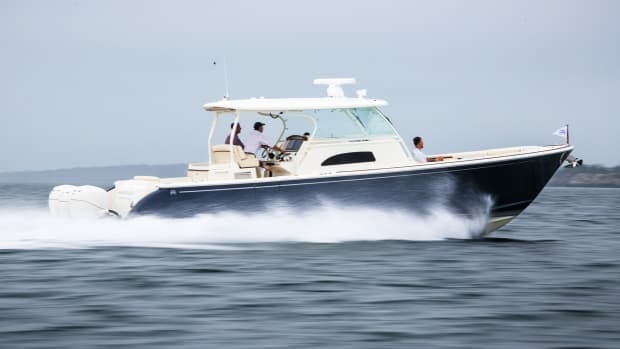 Penned by Power & Motoryacht columnist Mike Peters, the hull is built in a process called Triguard construction, where an E glass outer skin and carbon fiber inner skin sandwich Corecell foam. 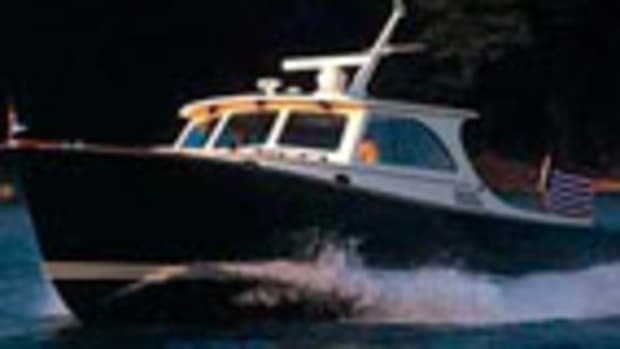 The result is a boat that’s both strong and relatively light (25,000 pounds). 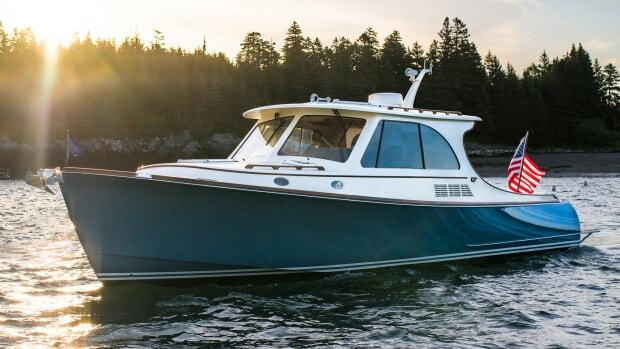 Propulsion for the largest picnic boat to date (her siblings are 34 and 37 feet LOA) will be 480-horsepower Cummins diesels paired to Hamilton 322 jets drives. 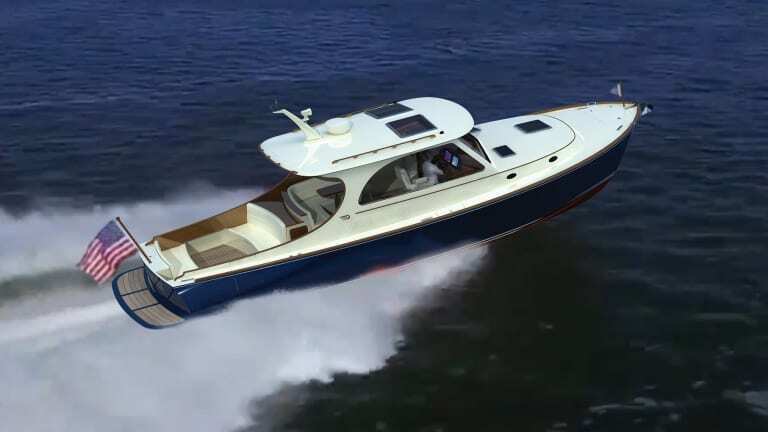 This power plant should push the Peters-designed hull, with 19-degree deadrise, to about 34 knots, according to Hinckley. 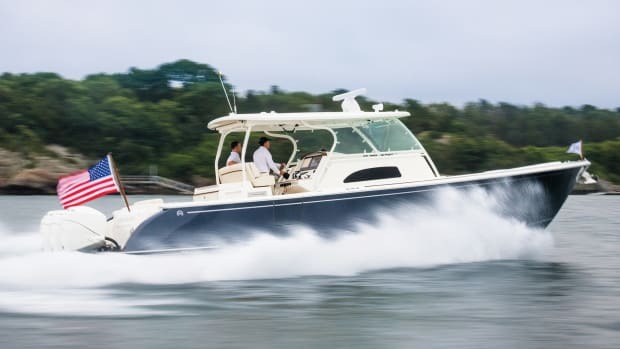 Optional 550-horsepower Cummins should lend the boat a top end of 38 knots. 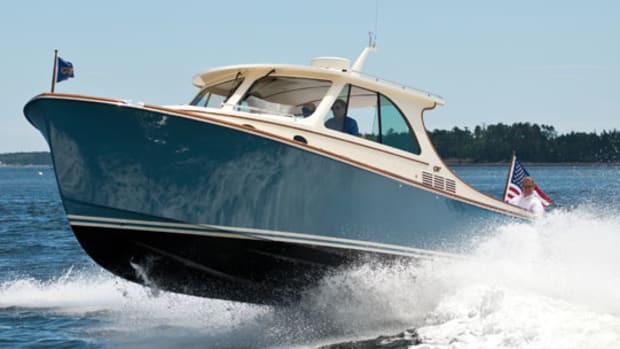 Thanks to these top ends, and the maneuverability Hamilton Jets are known for, the Picnic Boat 40 has all the characteristics of a sporty day boat. But should that day be too much fun, it can easily double as a weekender with a dining area below that converts to a double berth courtesy of a hi-lo table. A galley and head with standup headroom round out the amenities needed for an overnight (or two or three or ... you get the idea). 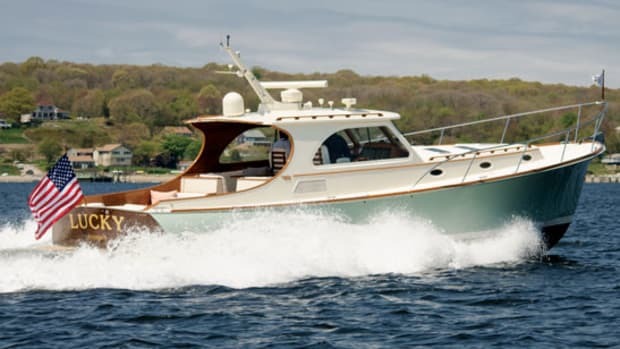 With styling and creature comforts borrowed from the picnic boats of yesterday with the technology of tomorrow, the Hinckley 40 might just combine the best of both worlds. We look forward to putting her to the test when she splashes in summer 2018.